Gusty winds and low humidity in drought-stricken areas will create dangerous fire conditions in parts of Colorado, Kansas, New Mexico, Oklahoma and Texas, according to the Storm Prediction Center in Norman, Oklahoma. National Weather Service meteorologist Doug Speheger said such conditions haven’t been seen in at least a decade. By early afternoon Tuesday, temperatures that were projected to reach the mid-90s had reached 88 degrees (31 Celsius) with humidity at 6 percent. Wind gusts forecast to hit 40 mph (64 kph) were at 24 mph (39 kph). The forecast includes northwestern Texas and the Texas Panhandle where firefighting aircraft are stationed in Amarillo, Abilene and surrounding areas. “With these conditions, wildfires can spread rapidly, present control issues for firefighters and pose a real threat to public safety,” said Texas A&M Forest Service Fire Chief Mark Stanford. Deb Beard, a commander of the Southern Area Incident Management team sent by the U.S. Forest Service, described the conditions as terrifying. “If you looked at that fire weather forecast … it should scare the hell out of you,” Deb Beard said during a briefing Tuesday posted on the Oklahoma Forestry Service’s Facebook page. In Oklahoma, two people have died in the fires and nine others have been taken to hospitals for smoke inhalation or heat-related injuries, emergency management officials reported. Oklahoma Forestry Services reported Tuesday that the largest of the Oklahoma fires has burned more than 388 square miles (1,005 sq. 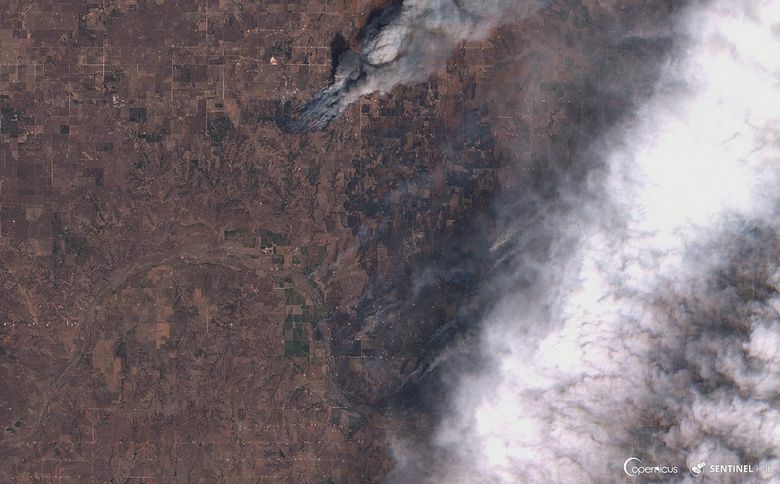 kilometers) near Leedey, about 110 miles (180 kilometers) northwest of Oklahoma City, and was about 3 percent contained. The fire near Woodward, about 20 miles (32 kilometers) north of Leedey, is about 45 percent contained, according to the forestry service. At the fire near Woodward, spokesman John Nichols said firefighters worked Monday to strengthen fire lines in preparation for the gusty weather Tuesday. The weather service said rain and thunderstorm chances will increase Thursday night and Friday with strong to severe storms possible in southwestern Oklahoma and western north Texas on Friday.